India’s leading smartphone brand Xiaomi launched its first major non-smartphone product, the Mi TV 4, in India last month. With a price tag of just Rs. 39,999, it is clear that the Beijing-based company is planning to take on companies such Intex, Micromax, and Vu. Following Xiaomi’s assault, Vu TVs is now planning to launch a new Android TV in India. The company has started sending press invites for an event which is scheduled for March 13. 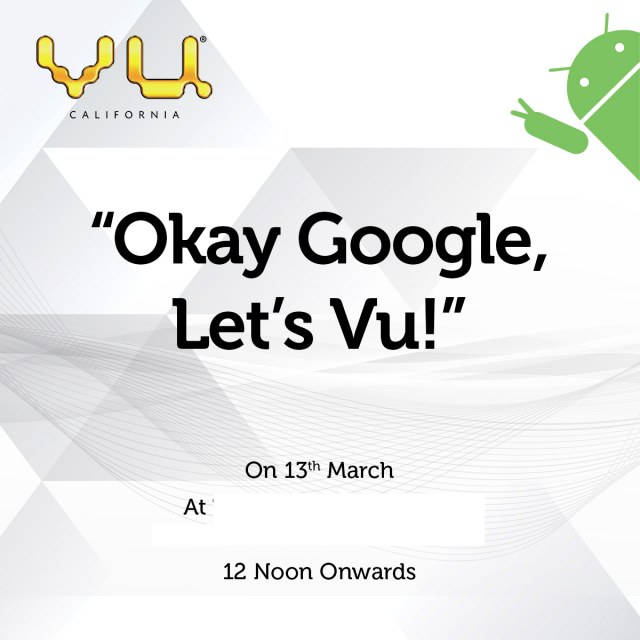 As you can see from the image above, Vu is clearing hinting at a launch of an Android TV. The invite reads, “Okay Google, Let’s Vu!” This could indicate that TV will have Google Assistant integration as that’s the voice hotword to bring up the assistant. Considering the fact Xiaomi’s TV lacks voice search functionality, Vu might have an edge here with this new TV. Sadly, that’s about everything we have on Vu’s new TVs right now. But if you look at Vu’s existing TV line up, the company has a wide array of offerings. Vu’s basic 32-inch HD TV starts at Rs. 20,800 and goes all the way up to Rs. 4,50,200 for the top of the line premium 4K Smart TV. The company even launched Quantum LED TVs earlier this year, so it’s clearly gunning for the high-end market as well. That said, it is unclear how many products the company would be unveiling on March 13. Whatever it is, we’ll find out soon. Lastly, it is also worth making a note that Xiaomi is said to launch new TVs tomorrow in India. Although there’s no official confirmation, it looks like we’ll getting the new Mi TV 4A in India. It looks like it’s about to rain TVs in the next couple of days. So, stay tuned for more info all the upcoming launches.